I've been planning out this fun St. Patrick's Day art piece all week long. This morning, I got it all done! 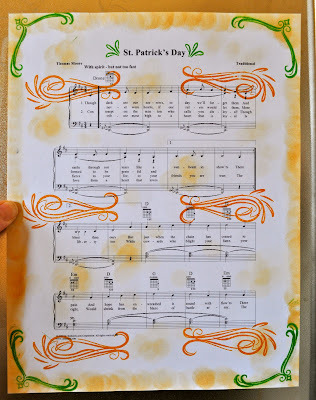 I started off by printing a St. Patrick's Day song that I borrowed from Online Sheet Music. I decided it would be fun to make the paper look sort of vintage. While you may be thinking it's a super easy thing to whip up something like this real quick, I was actually met by many obstacles!! Soy sauce made it look too dark..and smell really bad! Finally, I decided to just work on my frame while I was considering what to do with the paper. First, I sanded the frame to remove the glossy stain. Then I spray painted the frame with Krylon Satin Ivory. 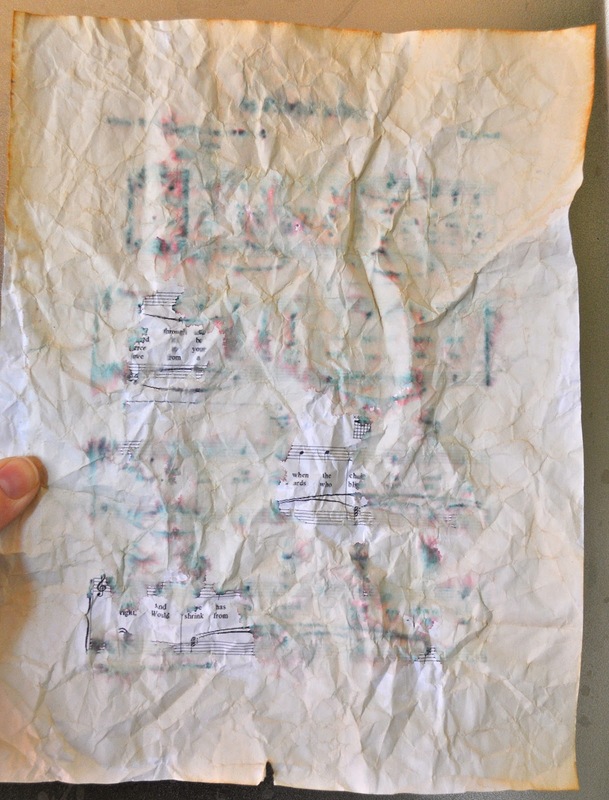 I had to crumple it up a bit and burn all the edges. I must say, that's my best burn job yet! My husband bought me this great scrapbooking paper last Mother's Day so I used it to cover the cardboard frame backing. 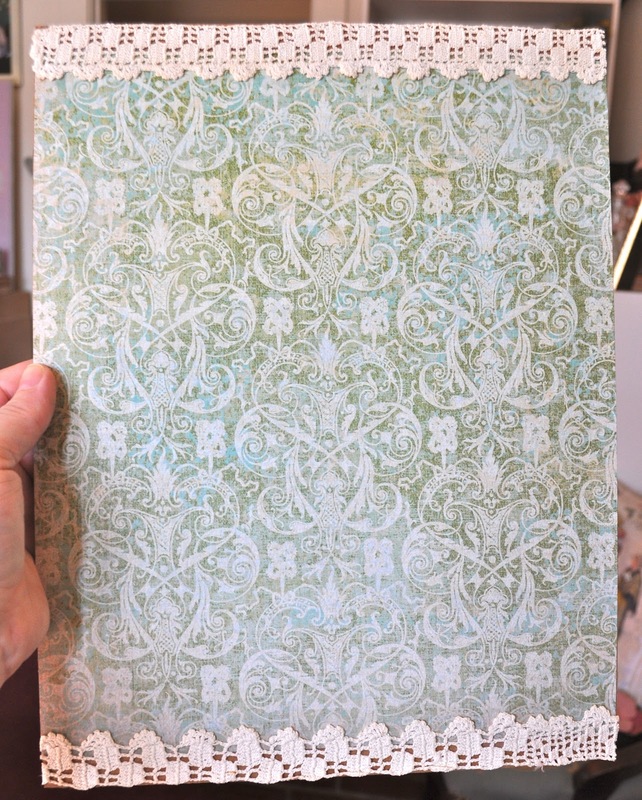 Since it wasn't quite long enough to cover the whole piece of cardboard, I added some of this neat vintage lace to the top and bottom. A friend from Holland sent it to me at Christmastime. 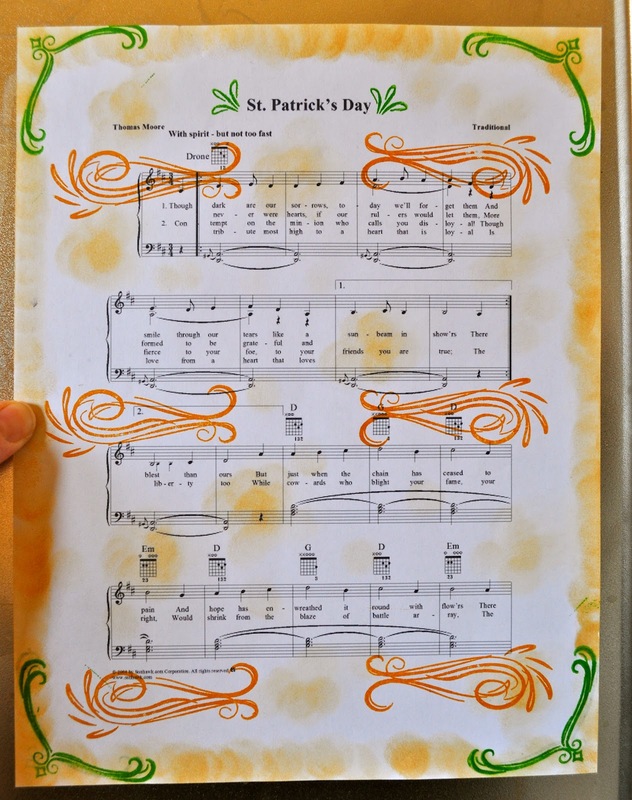 Then, I glued the sheet of music to the cardboard piece and began adding embellishments. This cute little Irish girl got the Stickles treatment in Gold and Diamond. I found her and her brother at Salvation Army a few days ago! They're vintage Dennison...I just love them! 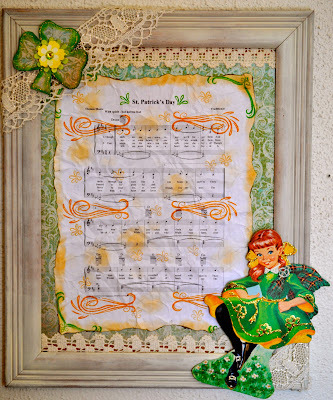 I cut this little clover from a shamrock template I found online and added some more Stickles and a cute embellishment that my husband put in my Christmas stocking! I also added more of that lace from Holland in each corner. All done! I wonder if I should do another one featuring the little boy cut out that matches her? Sarah, this is just adorable! You did a beautiful job on creating. You are very talented and created a master piece. I'm Connie @ http://hotflashncraftn.blogspot.com/. I'm your newest LF. Stop by and be my friend, too. Your picture is just so cute. I received your package this week. I apologize I did not get in touch with you sooner. You are just so sweet I love all my goodies. Thank you so much for you generosity. Your blog is so sweet. I am your newest follower. It is really nice to meet you. Please thank Lynzie for me the bookmark is adorable. She does great work. Hi! 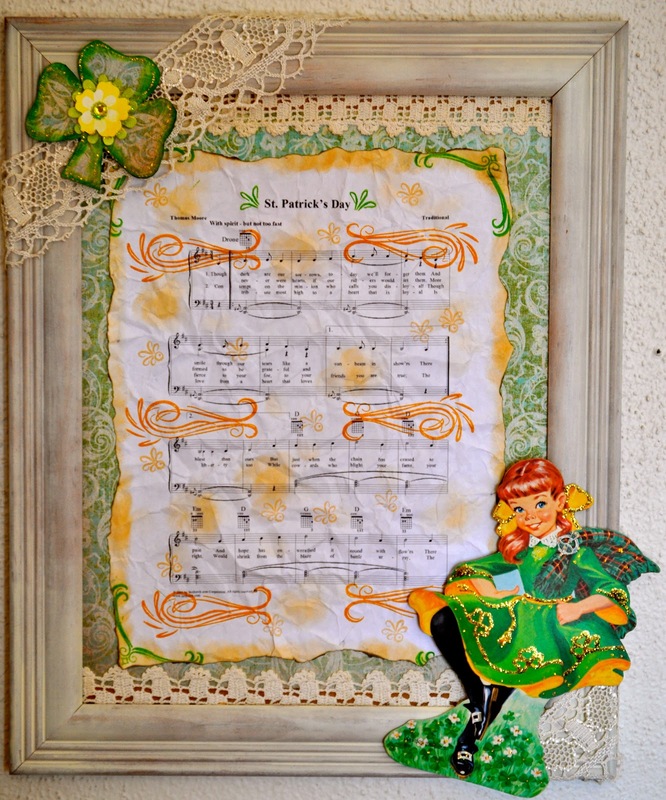 I think your St.Patrick's Day music decoration turned out real cute! 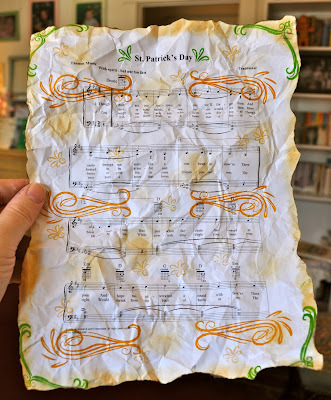 I usually wipe a wet teabag, or paint on strong tea or coffee, right on paper I'm aging, then blot it and sometimes iron it dry, but there is a mist, Tsukineko Walnut Ink Antiquing Solution, 2 oz. bottle from Michael's that many crafters use with great results. yes, make a matching boy design with another song, that will be nice to have a set. 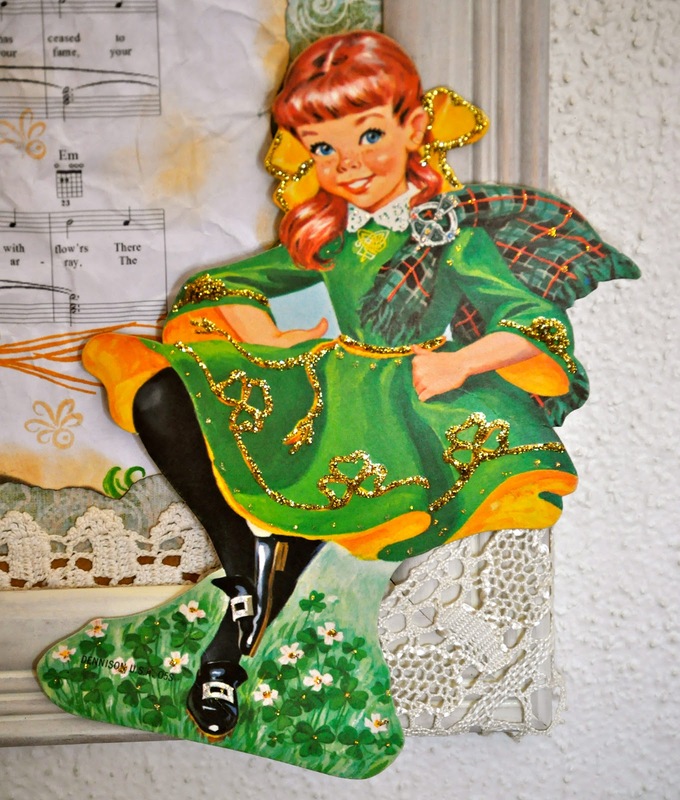 Are you making Irish potato candies? I always do, they originated in Philadephia, near me, and they are yummy! Love your creation! How clever and so darn cute. I also love your blog. I look forward to visiting you again. I am trying to visit every PS entry but it has taken me longer due to unexpected happenings over the weekend.